Copyright Week stories at Techdirt. stories filed under: "copyright week"
This week has been Copyright Week, put together each year by the EFF and others, giving lots of people and organizations a chance to weigh in on a variety of copyright issues. Each day has its own theme, and in the past, I've tried to participate each day -- as (not surprisingly) I have thoughts about each of the topics. This year, unfortunately, I've been a bit busier than usual, meaning I haven't had as much time to write. But, still, if you check out the Copyright Week site, you can see lots of great articles by others on various topics. This being the last day of Copyright Week, it hits on a topic that I think is the most important of all: copyright and free speech. Last fall, I gave a talk at Wikimedia in which I noted that copyright has a serious free speech problem, and we're never going to fix what ails copyright until we address that simple fact. What's most striking to me is how many people try to completely deny that copyright could ever be used to stifle free expression. It seems intellectually dishonest to make such a claim. There are tons and tons of examples of copyright being used to stifle different forms of expression -- from blocking derivative works to sending bogus takedowns and more. Copyright can be and is frequently used to stifle expression. That should be a concern. On the flip side, many (including, at times, the Supreme Court) have argued that copyright itself is also an engine of free expression. This may also be true. Copyright can both be an engine of expression and stifle expression at the same time. The challenge, then, is to figure out how we can increase the engines of expression while minimizing the ability to stifle expression. And to do that, we need to break down a few different components to explore the competing factors. The first is to look at the question of whether or not copyright is necessary to accomplish the goals of promoting this kind of new speech. In many cases, it very well may be. But I find it difficult to believe that it is the only, or even the most important, tool for doing so. Yet, that is how it is mostly structured today. With copyright automatically applying to any new work created by a person, it doesn't make much sense. Copyright should only make sense when it is the copyright itself that is the incentive for creation. If the work would be created no matter what, even absent the copyright, why is the copyright needed? Why, for example, do I need to get a copyright in every email I write? I can tell you that I have never been incentivized by the copyright system to write an email (other than, perhaps, to email with others about problems of the copyright system). On top of that, what we've seen over the last few years, is that copyright is often not the best incentive for creating new creative content. In an age where we're seeing lots of new business models develop, very few of them are actually dependent on copyright. It raises a serious question of why, by law, we naturally assume that copyright must be the grounding of every content business model, when time has shown it is quite frequently not the best nor the most efficient business model -- and one that is often saddled with downsides and limitations. Given that, it seems quite reasonable to ask why we don't scale back the copyright system to cases where it clearly (or at least likely) is a key part of the incentive for that creation. Doing that wouldn't (by definition!) harm any new creations, but it would take away the ability to abuse the excessive copyrights to stifle freedom of expression in other areas. Similarly, we should look at the situations in which copyright is regularly abused to stifle free expression, and see how to minimize that. A major area for abuse (though hardly the only one) is in bogus DMCA takedowns. That is not to suggest all (or even most) DMCA takedowns are bogus. Many are perfectly legit and do exactly what they're supposed to do. But an unfortunately large number of DMCA notices are used to try to take down content that someone just doesn't like, but which is not in any way infringing. Here, there are a number of possible answers. I probably lean towards moving to a notice-and-notice system, rather than a notice-and-takedown, because that keeps the content up while the receiving party has a chance to counterclaim. Thus, you avoid even the temporary suppression of free speech. Others prefer a solution that puts real meat on punishing those who file bogus DMCA takedowns, which isn't necessarily a bad idea, but could lead to other problems as well. In short, we've designed our copyright system in a dangerous way: it's one that actively encourages the use of copyright to stifle free expression, rather than to encourage it. And that's not just unfortunate for free expression and the free exchange of ideas, it's unfortunate for copyright as well. It's that structure, so open to abuse, that leads people to not respect copyright at all, and to naturally assume it must be all bad, rather than just partially rotten. If the copyright system supporters were serious about bringing respect back to copyright, one area where they should start, and where we could all agree, would be to make these kinds of fixes to copyright law, that would align copyright's incentives properly with encouraging new works, and to move away from the elements of copyright that make it such an easy tool for censorship and stifling freedom of expression. All week we've been posting stories for Copyright Week, discussing important elements of copyright law that are at risk of getting trampled or destroyed in the effort to reform copyright. These are issues that will be squashed almost entirely if we leave it to the lobbyists to hash out what a new copyright law looks like. Today is the final day of Copyright Week, which happens to coincide with the second anniversary of Internet Freedom Day -- the day that the internet spoke up and said NO!! the last time a group of lobbyist sought to change copyright in dangerous ways, with SOPA/PIPA. So how can we get copyright right? Well, respecting things like transparency, the public domain, open access, the freedom to tinker and fair use are certainly important and necessary starting points. Decisions need to be made based on empirical data. As we've discussed in the past, historically, copyright reform discussions have been almost entirely faith-based. This is why the claims of "everyone just wants stuff for free" are so concerning," since the data suggests that's not even close to true. Given the recent call for objective research that would be practical in the copyright debate by the US National Research Council, I'm hopeful that we'll actually begin to see some useful data for this discussion. Hopefully those in Congress will actually pay attention to the data, rather than continue to insist that blatantly false claims must be true. After I posted this last time, I had two lobbyists accuse me of being insane (literally -- they claimed I had mental deficiencies) for daring to suggest that everyone is both a creator and a content consumer. Of course, there's an easy response to that: if not everyone is a content creator, then perhaps we shouldn't have copyright laws that automatically grant life + 70 years copyright to every email they write. But, really, if we can stop looking at copyright as some sort of silly war between "artists" and "technologists" we could actually make a fair bit of progress. Copyright was always supposed to be about benefiting the public -- and when innovation opens up new opportunities for artists and consumers alike, that can work hand in hand. Rather than viewing copyright policy as a zero sum game where one party "winning" means someone else losing, let's recognize that the only real stakeholder is the public, and any policy should be designed to be best for the public, and that's one where both artists and technologists are better off as well, because new technologies enable artists to better create, promote, distribute, connect and monetize their works, while providing the public with more content, more choices, more ways to support, more ways to share, more ways to express and to communicate. And the end result, as we've seen throughout history, tends to be better for just about everyone -- with the exception of those who stay wedded to obsolete models that are built around being the gatekeeper for areas of friction that no longer apply. Focus on what's best for the public and it will also be best for creators and technologists alike. That's how you "get copyright right." Update: This post was modified to better explain the role of the three-steps test in both Berne and the TPP. Today is day five of Copyright Week, where the focus is on fair use. Earlier today we already had Michael Petricone's excellent post about the innovations and consumer benefits unleashed by the Betamax ruling, which hinged on the concept of fair use. Over at Wired, Automattic's (the makers of WordPress) general counsel, Paul Sieminski, also has a great post talking about how much innovation is enabled by fair use and why companies should be fighting more to support their users' fair use rights. Meanwhile, over at Public Knowledge, there's a good discussion of how the flexibility of fair use is important in enabling it to respond to new innovations. These are all great ways of looking at the issue. I wanted to focus on a different aspect of fair use, however, and that's the unfortunate fact that it is often described (especially in official political discussions) as an "exception or limitation" to copyright. That implies, incorrectly, that copyright is "the normal state" and that fair use is something that can only be used in "exceptional" cases, where a political body has decided to carve out some small breathing space. But that's wrong. Fair use is about the rights of the public to speak, to make use of content, to comment, to criticize and to express themselves. These are fundamental rights of the public -- not "exceptions or limitations." It is, instead, copyright that has always been an "exception and limitation" on the rights to free expression. We can (and should) discuss and debate the proper levels of copyright and its limitations on expression. But to frame things as if fair use is a minor "exception" is a subtle but dangerous twist of language that copyright maximalists have been employing for far too long. And it's a public right that is under threat. While negotiators were (after decades of negotiating) able to work out a WIPO Treaty for the Blind last year, copyright maximalists fought hard against it, because they were convinced that any attempt to expand what they called "limitations and exceptions" would set a dangerous precedent. And, if you look at things like the Trans Pacific Partnership (TPP agreement), the USTR tried to take credit for it being the first time that it was willing to include "limitations and exceptions" in a trade agreement. That, on its face, is true (and it's better than previous agreements, like ACTA, which ignored fair use and the public's rights entirely), but the wording does not in fact establish any limitations or exceptions: it sets out parameters that curb what limitations and exceptions countries are allowed to offer. The wording is based on a three-factor standard that is actually more restrictive than current fair use laws in the US. The standard is clearly modelled after the Berne convention, to which the US is already a signatory despite several differences, such as fair use, between US copyright law and that treaty's requirements. The TPP's "exceptions" would only serve to solidify these inflexible fair use requirements that the US currently, mercifully, defies. Pay close attention to this issue as we go through the copyright reform process. Fair use isn't just some limitation or exception. It's not just -- as some have said -- a "valve" on copyright restricting speech. It is, instead, core to the very concept of free speech. It is the public's rights. Don't let the language twisters try to frame the debate as one about "limitations and exceptions" because if that's the debate, we've already lost. Fair use doesn't just enable all kinds of important innovations -- including much of the internet you use and love today. It represents a fundamental right of you to express yourself, and that right must not be taken away. The latest in our posts for Copyright Week explores the concept of "you bought it, you own it," and how that's going away thanks to copyright. What's funny (or depressing) is that copyright's strongest defenders like to claim that protecting stronger copyright is about increasing "property rights." We've long since pointed out that copyright and property are very different. Property, as a concept, was developed to better manage the efficient allocation of scarce resources. But when something isn't scarce, it simply makes no sense to have a property right around it. What is then the nature of the pursuer's right? He does not pretend to say, that it is a right to any corpus, to any subject that can be possessed, or that can be stolen from him. Ergo, it is not property. Taking it in all views, no more can be made of it than to be a privilege or monopoly, which entitles the claimant to the commerce of a certain book, and excludes all others from making money by it. The important question then is, from what source is this monopoly derived, a monopoly that endures for ever, and is effectual against all the world? 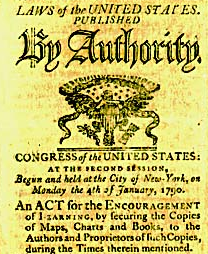 The act of Queen Anne bestows this monopoly upon authors for a limited time upon certain conditions. But our legislature, far from acknowledging a perpetual monopoly at common law, declares that it shall last no longer than a limited time. But to follow out the common law. The composer of a valuable book has great merit with respect to the public: his proper reward is approbation and praise, and he seldom fails of that reward. But what is it that entitles him to a pecuniary reward? If he be entitled, the composer of a picture, of a machine, and the inventor of every useful art, is equally entitled. Such a monopoly, so far from being founded on common law, is contradictory to the first principles of society. Why was man made a social being, but to benefit by society, and to partake of all the improvements of society in its progress toward perfection? At the same time, he was made an imitative being, in order to follow what he sees done by others. But to bestow on inventors the monopoly of their productions, would in effect counteract the designs of Providence, in making man a social and imitative being: it would be a miserable cramp upon improvements, and prevent the general use of them. Consider the plough, the loom, the spinning wheel. Would it not sound oddly, that it would be rank injustice for any man to employ these useful machines, without consent of the original inventors and those deriving right from them? At that rate, it would be in the power of the inventors to deprive mankind both of food and raiment. The gelding of cattle for food, was not known at the siege of Troy. Was the inventor entitled to a monopoly so as to bar others from gelding their cattle? What shall be said of the art of printing? If the monopoly of this useful art was to be perpetual, it would be a sad case for learned men, and for the interest of learning in general: it would enhance the price of books far beyond the reach of ordinary readers. Such a monopoly would raise a fund sufficient to purchase a great kingdom. The works alone of Shakespeare, or of Milton, would be a vast estate. Te art of making salt water fresh is a very late invention. Was it ever dreamed to be a transgression against property, to use that art without consent of the inventor? I observe, in the next place, that this claim, far from being founded on property, is inconsistent with it. The privilege an author has by statute, is known to all the world. But I purchase a book not entered in Stationer's hall; does it not become my property? I see a curious machine, the fire engine, for example. I carry it away in my memory, and construct another by it. Is not that machine, the work of my own hand, my property? I buy a curious picture, is there any thing to bar me from giving copies without end? It is a rule in all laws, that the commerce of moveables ought to be free; and yet, according to the pursuer's doctrine, the property of moveables may be subjected to endless limitations and restrictions that hitherto have not been thought of, and would render the commerce of moveables extremely hazardous. At any rate, the author of avery wise or witty saying, uttered even in conversation, has a monopoly of it; and no man is at liberty to repeat it. Lord Kames immediately understands the dangerous nature of how copyright can actually interfere with the property rights of others, and it's a situation that has gotten significantly worse over time, especially now that all sorts of things -- digital and physical -- include code or other content that can be covered by copyright law. And, as such, things that we "buy" every day are no longer actually being bought, but rather licensed -- and with that license comes all of the restrictions that Lord Kames mocked as crazy centuries ago. Today, we see a renewed attack on the rights of consumers by big business. Overly zealous regulation means that consumers are essentially barred from "unlocking" a cell phone, or severing the device from its original wireless carrier. Critics warn that such restrictions not only limit the rights of consumers but threaten to stifle old-fashioned tinkering and innovation. It is as if Ford told customers that they can't pop the hood of their car and mess around its inner workings (which is how the world got NASCAR, incidentally). How far should a phone company's power extend into our personal lives when we buy one of their products? When you buy a phone or an MP3, is it really yours—or has a company just loaned it to you with a laundry list of stipulations and provisos? The age of cloud computing is upon us, and soon most of our books, movies, and musics might have no material form. We may discover that buying something no longer means owning it in any meaningful sense—and our stuff isn't really ours anymore. It used to be that if you bought something, you owned it. That's a property right. But that's being constantly eroded thanks to the over-aggressive use of copyright. Even worse, many of the worst abusers of this want the best of both worlds. They want to pretend something is a purchase when it benefits them, while arguing that same "purchase" is just a license at other times. It's Schrodinger's copyright. But the end result is the same: copyright is being used to take away basic property rights by hiding it in the fine print. And that has massive implications for ownership, economics and innovation. True property rights are key to a functioning economy. But when everything you buy is not actually yours, and you're unable to do what you want with it, then you limit the ability to build up markets and to further innovate. So much innovation comes from someone taking something they've bought, tinkering with it, changing it, improving it, making it useful for other purposes. But in a world where copyright and control rule over all, you limit that kind of innovation, such that only the copyright holder (often not the initial creator) can control that innovation and process. And that rarely ends well. So, yes, let's talk about property rights and how important they are. But if we're talking about copyright in that context, it needs to be by noting just how far copyright has gone to take away and destroy our basic property rights. And that's something that needs to change. Yesterday, for Copyright Week, we wrote about transparency (and the lack of it in making copyright law). Today's issue is the public domain. While we just wrote about the lack of new works going into the public domain this year (as happens every year in the US), I've seen some copyright maximalists asking why this is a big deal, since all the works listed are readily available to purchase. This is uninformed in the extreme. In the past I've suggested that everyone interested in these issues owes it to themselves to read James Boyle's excellent book, The Public Domain, and I'll reiterate that recommendation now. Not surprisingly, the book is available online for free, though you can also purchase a copy, which is a worthwhile investment. However, the damage that our missing public domain does to culture, society, learning and knowledge is quite incredible. Two years ago, we had mentioned some research done by Professor Paul Heald, in which he noticed an incredible thing about new books available from Amazon, showing that plenty of recent new books were available, but they fade quickly... until you hit 1922 (the basic limit, before which nearly all works are in the public domain). And then there's a sudden jump in the works available. See that big gap? All of that is lost culture thanks to our restrictive copyright laws, and the 1976 Act's ability to effectively kill off the public domain in the US. It should be seen as highly problematic that there are more books from the 1880s available for sale on Amazon than books from the 1980s. Since then, Prof. Heald has continued to do even more research into the public domain and how it's distorted our cultural output and made much of it disappear, going beyond just books, but also exploring the impact on music. In an even more recent paper, a draft of a book chapter, Prof. Heald again dives into the issue of the way copyright law has distorted the availability of culture. He takes that earlier chart, and then decides to compare the "new books" available on Amazon with "used books" available on ABE books (the most popular marketplace for used books), and shows the market distortions clearly: In the paper, Heald also makes the case that the arguments against the public domain don't make much sense. The idea that works would be "under exploited" because they convey no ownership is simply not supported by the data -- as seen above. Similarly, the idea of works being "over exploited" because "anyone can do anything with them" seems just silly. It's a misunderstanding of the "tragedy of the commons," and there appears to be little empirical research to support the idea that there's any real problem here. 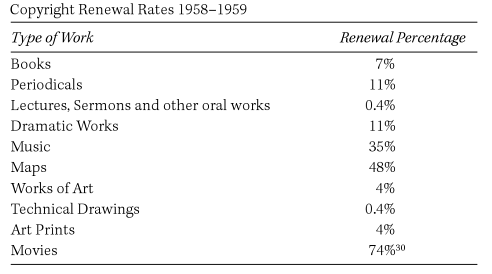 As a related matter, we've pointed in the past to research concerning copyright renewal rates, as found in William Patry's excellent book, Moral Panics and the Copyright Wars. Prior to the 1976 Act, copyright holders not only had to register, but they also had to "renew" their copyright after 28 years if they wanted a second 28 years of protection. And yet, in 1958 and 1959, very few works were actually renewed. In fact, as you can see, with the exception of movies, the vast majority of copyright holders in every other area were actually fine with letting their works fall into the public domain after 28 years. And yet, for reasons that are still unexplained, we now automatically give them life plus 70 additional years, even though all of the evidence suggests they neither need nor want that level of protection, and that such levels of protection appear to make their works significantly less available. And none of that even touches on the nature of creativity, and the way in which amazing new works often borrow and build upon the works of those who came before them. The greatest works of Shakespeare were more or less copied from others -- but he was able to make them into something special. Why is that such a problem? If someone can make use of the work of someone else who failed to make it spectacular, and turn it into something amazing, why are we precluding that possibility? The entire purpose of copyright law in the US was supposed to be about enabling greater dissemination of learning and knowledge, and that's by increasing the public domain. Yet, instead, because of regulatory capture, and the ability of gatekeepers to hijack the process, we've created a copyright law that does exactly the opposite. It restricts the dissemination of knowledge, decreases cultural sharing and availability, and generally harms creators and their ability to build on culturally relevant works. What defenders of restrictive copyrights often fail to recognize is that the public domain is what made culture culture. Culture is a shared concept, in which lots of people are all experiencing the same or similar things -- and making it their own as a part of that. We used to share stories, retell jokes, build on and change the works of others, and it was that shared effort that built culture and helped it spread. But copyright law has changed all that. Rather than a true cultural phenomenon, where culture is built up by the public in terms of what they create, share and build upon, we now have a situation where the gatekeepers decide what culture is, push it on everyone via broadcast means, and then tell us not to do anything about it... unless we pay exorbitant sums. That's a perverse understanding of how culture happens, and one that does not benefit creators or the public (often one and the same), but is hugely beneficial for a few gatekeepers. For a robust creative community and culture, it is important to bring back a healthy respect for the public domain. I have heard the argument that transparency would undermine the Administration's policy to complete the trade agreement because public opposition would be significant. If transparency would lead to widespread public opposition to a trade agreement, then that trade agreement should not be the policy of the United States. I believe in transparency and democracy and I think the U.S. Trade Representative (USTR) should too. The EFF and a bunch of other organizations have designated this week as Copyright Week -- a chance for the public to weigh in and discuss copyright law and where it needs to go. They've put together a series of principles, that are worth reading. Each day will discuss different topics related to copyright law, specifically focusing on the aspects that are important to the public -- and which seem to be ignored (or pushed to the side) by copyright maximalists. Today's principle is "transparency" -- something that has been sorely lacking in copyright law for quite some time. As you know, the history of copyright law is that it's supposed to be about using limited monopolies to encourage the dissemination of knowledge for the purpose of scientific advancement and learning. Yet, from the very beginning, it's been used for other purposes: initially for censorship and control, usually by gatekeepers, who are attempting to limit and control content production and dissemination for the sake of keeping the costs artificially high, allowing them to take the majority of the profits, often leaving the actual creators with little -- and the public with extreme limits on how they can communicate. In recent decades, this has gotten much more extreme, as those gatekeepers have hijacked the legislative process multiple times with a very clever, but ultimately bogus "story," in which they pretend that they are representing content creators, even as they work hard to screw over those artists. Maximalist lobbyists have taken an incredible approach to ratcheting up copyright laws around the globe, hitting on dozens of different ways to continually push through changes without public input or opinion. One recent example: in 1995, President Clinton's "commissioner of patents and trademarks," Bruce Lehman, released a white paper that pushed for the draconian copyright provisions of the DMCA, including takedowns and anti-circumvention provisions. In the light of day -- where at least some people were watching what Congress was doing -- no such laws could be passed. However, Lehman was so tied to Hollywood's interests, that he's actually happy to admit that when Congress wouldn't pass such a law he did "an end-run around Congress" by running to WIPO (where the public was not watching), and getting a "treaty" passed, which basically required the DMCA. Treaty in hand, maximalists ran back to Congress, screaming about how we had to pass the DMCA or violate our "international obligations." And, it worked. While large ISPs were (thankfully) able to make enough noise to include the one good part of the DMCA -- the safe harbor provisions for service providers -- the rest of the terrible DMCA came into law entirely because of this sneaky process used by Lehman and other maximalists to hide away from where the public was looking, and push through some agreement. This has been the ongoing plan for quite some time. Maximalists will push through bad legislation wherever possible, and then use international treaties and trade agreements to try to take the worst laws they were able to get in one place, and "harmonize" them, to make them required everywhere. And it's been quite effective. Using international agreements, negotiated in secret, to then tie the hands of legislatures has been used countless times to expand copyright law around the globe over the last couple decades. But in the last couple years, something changed. It started with SOPA. A deal that was entirely negotiated in the backrooms by copyright maximalists and their friends in Congress failed completely when the public realized what was going on. Soon after that, ACTA, yet another "international agreement" that pushed for "harmonizing" maximalist rules, and which was negotiated entirely in secret, flopped in Europe after the public was exposed to it. And yet, the maximalist lobbyists and their friends at the USTR (who, surprise surprise, are often the same people), continue to believe that they can use this strategy going forward. Negotiate in secret, refuse to be open to the public, and then tie Congress' hands. That's what's happening now with the TPP and the TTIP/TAFTA agreements. The USTR has absolutely refused anything resembling transparency -- while insultingly insisting that they're being incredibly transparent, because they'll "consult" with anyone. But, as we've explained countless times, listening is not transparency. Transparency is about providing information back, sharing what's being negotiated in our name, and then not supporting Congress limiting itself from actually discussing what's in the document. The USTR and Hollywood have a playbook from the last couple of decades to continually ratchet up copyright law, and limit any attempt to roll back its excesses. And it starts with a complete lack of transparency. It has to. Because, as we saw with SOPA and ACTA, when you actually let the public see what's being pushed for in our name, they fight back, and they say "we do not want this." And, as Senator Warren pointed out, if the American people do not want it, then it should not be the policy of the United States. A lack of transparency in copyright policy serves only the desires of the maximalist to control speech, to limit innovation and to harm creators and the public (who are often one and the same). It's an undemocratic attempt to aid a group of greedy gatekeepers, whose interests are antithetical to the intent and purpose of copyright law. That the USTR has been willing to support this effort, and works hand in hand with Hollywood to make sure there is no transparency at all is the true travesty in all of this, and should raise significant questions about whom the USTR really works for. Is it the American public or is it Hollywood?